If you are a tamale lover and a chili lover then this is a recipe you won’t want to miss out on. I myself completely love the both of them, so when I discovered they could be combined into one I was thrilled. The traditional tamale pie contains corn meal or a cornbread mix but a traditional tamale dough is made from masa or masa harina (which is a type of corn flour that is often treated with lime juice and has a finer grind than cornmeal). I love the flavor and texture of a tamale dough once it has been cooked. I still dream about the batch of tamales that the sweet mexican women made for me when I was traveling in Mexico several years ago. The typical tamale pie usually either consists of ground beef or beans (such as black and pinto). I decided to combine the both of them because when I had it before will all meat, it actually seemed like too much meat, kind of like a chili without beans. One more difference that is not so typical is that I baked the tamale dough on bottom, so it’s more of a crust than a topping like most. 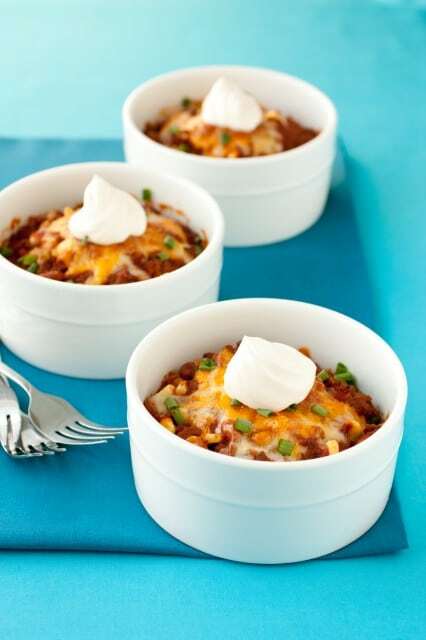 This tamale pie is full of exciting Southwestern flavors and it’s truly delicious. One great thing about this meal is it’s convenience. It is just that, a meal all in one and it contains ingredients that I nearly always have on hand. It may look like a lot of ingredients but a lot of it is spices that you likely have in your cupboard. 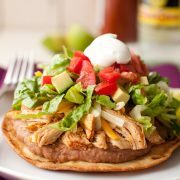 This family friendly meal is a breeze to put together and may just become a new favorite. If your a fan, don’t forget to top it with hot sauce. I can’t go without the stuff. Enjoy! 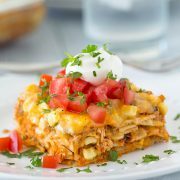 A Mexican inspired casserole layered with tamale masa, beef, beans, corn, and enchilada style sauce and cheese. Total comfort food! Preheat oven to 350 degrees. Heat olive oil in a deep 10-inch skillet over medium-high heat. Once oil is hot, crumble beef into oil and cook, stirring occasionally and breaking up beef while stirring, until beef has browned and cooked through. Drain fat from beef, reserving 1 Tbsp of fat in saucepan and transfer drained beef to a bowl, set aside. Return saucepan with fat to heat, add in onion and saute until tender and lightly golden, about 4 minutes, adding in minced garlic during the last 1 minute of sauteing. Reduce heat to medium, stir in tomato puree, cooked ground beef, pinto beans, corn, green chilies, chili powder, paprika, cumin, coriander and season mixture with salt and pepper to taste. Allow mixture to simmer while preparing tamale crust. In a mixing bowl, whisk together masa harina, baking powder and salt. Using your fingertips, blend butter into masa harina until mixture resembles coarse crumbs. Using a spoon, stir in hot water. Divide masa harina mixture among eight 12 - 14 oz ramekins and smooth into an even layer in ramekins (about 1/3 cup in each). Divide ground beef mixture over tamale layer (about a heaping 1/2 cup in each) then sprinkle cheese over tops. Set filled ramekins on a rimmed cookie sheet. Bake in preheated oven for 30 minutes. 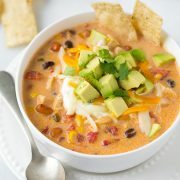 Serve garnished with chopped green onions or cilantro and a dollop of sour cream.